We exclusively market eggs from alternative husbandry methods such as barn, free-range and organic farming. The production of the eggs is subject to the strictest guidelines of the KAT association, which conforms with legal guidelines. Barn farming is where animals roam freely in the barn and have access to the entire premises at all times. Barn floors are covered with natural materials such as sand or straw; at least 1/3 of the barn area is available for the birds to scratch. The barn is spacious with a maximum of 9 hens per m² and max. 6,000 hens per unit. In order to replicate the natural behaviour patterns of hens, protected laying nests are provided. These nests consist of a base made from malleable materials and can be used by the animals at all times. A sufficient amount of perches provides each hen with at least 15cm of room, allowing them to relax without damaging the balls of their feet or claws. Fresh water and food is freely available at all times and the barns let in natural light for a natural day/night rhythm. Continuous ventilation provides the barn with sufficient fresh air and provides an optimum barn climate. The same criteria applies for free-range farming as with barn farming. The animals also have access to a free-range area close to the barn at all times. The free-range area provides plenty of protection and shelter for the animals in the form of hedges and maize, etc. To comply with KAT free-range farming, a cold scratching area is required to be built onto the barn. Similar to the free-range area, this must be accessible directly from the barn and offer the animals a bright, spacious area which also complies with legal requirements for keeping poultry indoors. 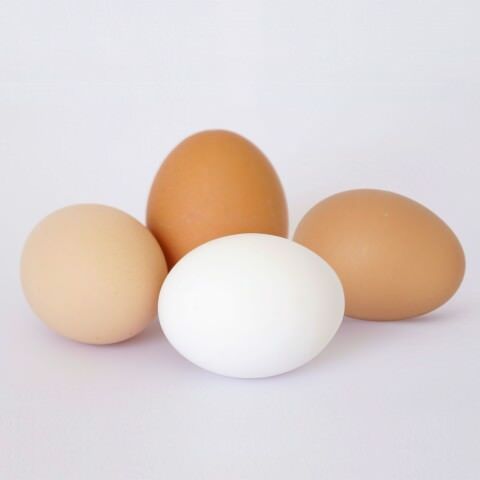 Organic production – also known as organic husbandry – means eggs are produced using completely organic methods. The feed used is exclusively organic with no genetic engineering. The preventive use of antibiotics and hormones is prohibited. The space for each hen is even greater than that for barn and free-range hens. Only 6 hens per m² are permitted in each stall and the group size is limited to 3,000 animals per unit. The perches in the stall also offer more space. This is the traditional variety of colour. 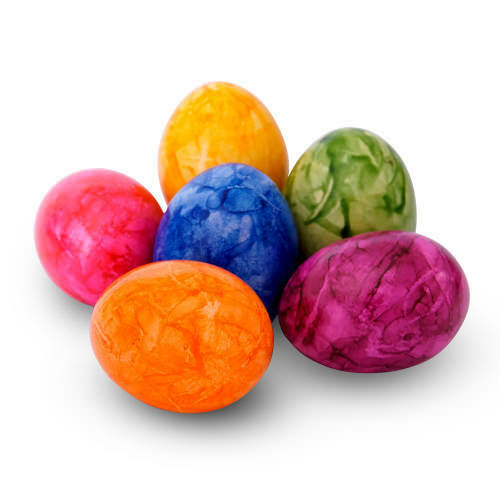 The intensive colouration and characteristic marbling is achieved by rolling the eggs over special inking pads. 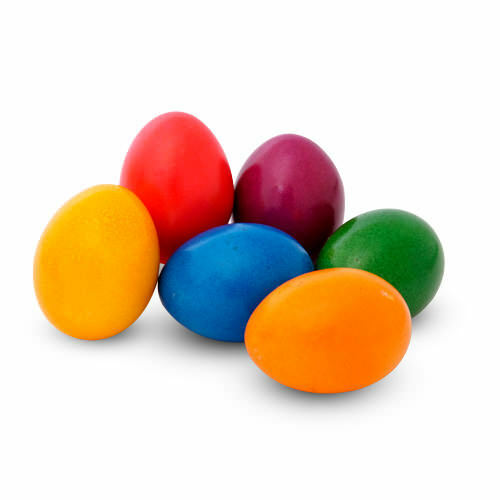 Our intensively coloured eggs are treated using special spray technology. 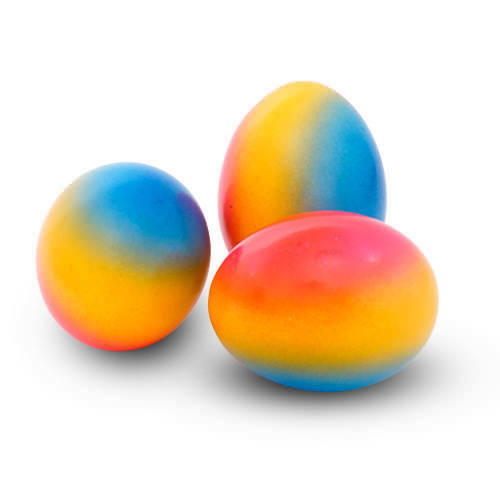 This gives the eggs high colour intensity and a brilliant shine. 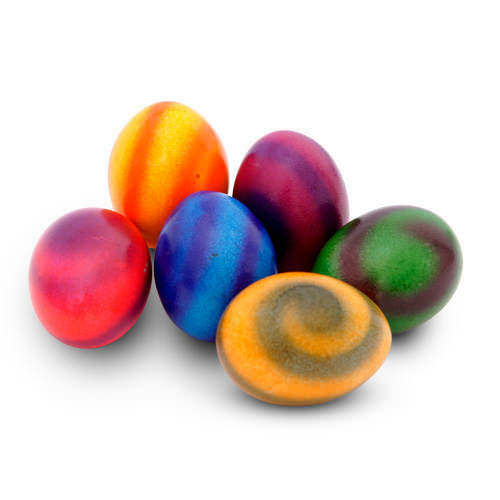 Our rainbow eggs are a real eye-catcher. Individual rings of colour gently flow into each other thanks to a special, delicate application of colour, creating a harmonious look. A wide variety of colour combinations are possible based on customer requirements. This elaborate colour effect is achieved by skilfully turning the eggs during the colouring process. A particularly special effect is created as a result and is becoming increasingly popular on the market. Our sister company, OVOBEST, is one of the leading manufacturers and marketers of egg products in Europe, producing goods in one of the most modern, high-performance egg-production plants in the world. Whether liquid, powder or special products with special, unique features: high-quality products are developed and produced for the food industry in direct consultation with the customer..
Our sister company, OVOBEST, is one of the leading manufacturers and marketers of egg products in Europe, producing goods in one of the most modern, high-performance egg-production plants in the world. Whether liquid, powder or special products with special, unique features: high-quality products are developed and produced for the food industry in direct consultation with the customer.